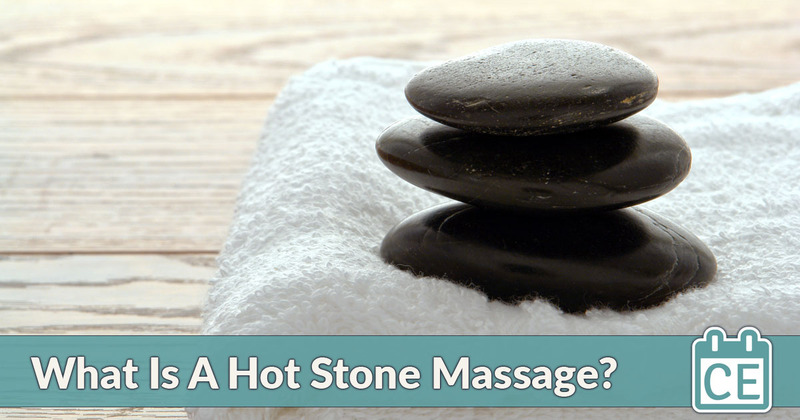 Home » Continuing Education » Hot/Cold Stone Massage » What Is A Hot Stone Massage? When people picture a spa massage, the Zen-like image of a person relaxing with hot stones on their back likely springs to mind. Hot stone massage is a popular spa therapy adapted from ancient healing traditions. For clients, it can be the ultimate relaxation experience. Stone massage therapy is a surprisingly varied set of techniques that use smooth stones as tools both for massage and for hot/cold therapy. A typical hot stone session lasts 90 minutes and combines the stones with Swedish, deep tissue and other massage modalities. While the classic image of stone massage shows the stones directly on the client’s skin, a sheet may be used between the skin and stones for safety reasons. Classic hot stone massage techniques use dark stones made from volcanic basalt, which hold heat well and transfers it slowly throughout a long session. Therapists interested in reiki or other mind-body therapies may use semi-precious stones or sanitized river rocks they find themselves. Himalayan salt stone massage uses stones made of pure Himalayan pink salt. The salt lightly exfoliates and softens the skin. Lava shell massage is a light, fluid technique that uses the shell of a particular clam species that holds heat longer than stones. Cold stone massage is hot stone’s useful but often overlooked sibling. Cold stone typically uses chilled marble, which is well-suited for slowly drawing heat from the skin. It’s a popular technique among migraine sufferers, and it can also be used to gently ease injured issues or reduce sinus swelling. LaStone, a well-known stone massage technique, uses both hot and cold stones. People have been enjoying the benefits of hot stone massage for thousands of years. Verbal and written records indicate ancient Chinese, Egyptians, Africans, Indians, Native Americans, Hawaiians and many other cultures used heated stones for therapeutic purposes. They were used to stimulate organs, relax cramps, and even alleviate discomfort during childbirth. Hot stone therapy didn’t become common in the modern massage community until LaStone Therapy was introduced in 1992. Its founder, Mary Nelson, was inspired to use heated sauna stones during a massage and was thrilled with the results. Modern hot stone therapy is heavily influenced by Chinese, Native American and Hawaiian traditions. Different schools of technique may focus on different inspirations, such as Native stone or Hawaiian stone. Stone massage is a wonderful combination of luxury feeling, soothing temperature therapies and effective massage techniques. The look and feeling of natural stone immediately gives clients a sense of indulgence. The therapist is able to apply heat and cold while they manipulate the muscles, and the stones can make excellent deep tissue massage tools. While safe when performed by a trained therapist, there are a few contraindications for hot stone massage. For example, clients suffering from inflammation, high blood pressure, have an injury or poorly managed diabetes shouldn’t have hot stone massage. Cold stone massage shouldn’t be performed on clients showing symptoms of nervous system injury. Neither should be performed on clients with neuropathy, numbness, or other peripheral nerve damage. Stone massage is a relatively easy therapy to learn and incorporate into your practice. Hot stone massage courses start around just 6 credit hours, and complete courses are rarely more than 20 credit hours. You can expect to learn sanitation and safety standards, massage techniques and how to incorporate add-on services like aromatherapy. Be aware that your hot stone massage class may not include the cost of stones, stone heaters and similar necessities. Comprehensive stone massage techniques offer both a certification and an excellent advertising advantage that can help you stand out in saturated markets. The most in-depth modalities blend hot stone with other modalities, like Hawaiian Lomi Lomi massage, and can be over 50 credit hours. Becoming a hot stone massage therapist can build your clientele and open up lucrative spa employment opportunities. It even gives your hands a break and offers you a change of pace from your regular routines. Whether you’re just starting out or a seasoned therapist, taking advantage of this multi-million dollar industry can be a good choice for your business.